Wembley is to host NFL games on back-to-back Sundays in the autumn of 2015. 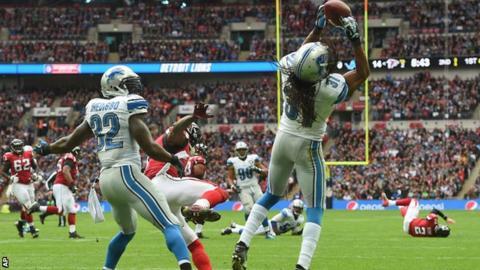 The double-header will see Jacksonville Jaguars and Buffalo Bills meet in London on 25 October, with Kansas City Chiefs and Detroit Lions facing off at the national stadium on 1 November. NFL executive vice-president Mark Waller said the move underlined "the growth and depth of our UK fan base." A third fixture will also be held at Wembley, with Miami Dolphins meeting New York Jets on 4 October. The announcement means the Dolphins, Jaguars and Lions will return to the UK for a second straight campaign, while the Jets, Bills and Chiefs will each be playing in London for the first time. The confirmation of three more regular-season games at Wembley in 2015 follows the same format as this year and highlights the league's continuing drive to tap into its UK audience. All three 2014 Wembley contests sold out several months in advance. That run of fixtures will end on Sunday when the Jaguars face the Dallas Cowboys.